This post is Day 3 of Vibrant Homeschooling’s “12 Days of Christmas Teachable Moments” series. Before the Thanksgiving turkey is even cold, it seems the Christmas season is underway. It flies by quickly, leaving us grasping at moments in an effort to focus on the true meaning of Christmas and to make memories with our families. Hoping to avoid the feeling of striving, my family celebrates Advent each year, stopping our regular homeschool studies and incorporating what we call Christmas School (and for us, a big part of that is our Jesse Tree). Our Advent tradition helps us to be still and know, to remember, and to treasure. Hoping to share our family’s traditions and activities with others, I compiled them into a website called Advent Idea Box. This includes tons of free unit studies, geography studies, crafts, and more to last each day of Advent. One of the activities that we do every year is the Jesse Tree. It is a special way to tell the redemption story, beginning with Creation and walking through the Bible all the way to the Resurrection. It illuminates how the Bible, from the very beginning, directs us to Jesus Christ. The idea of the Jesse Tree begins with Isaiah 11:1, which says: “A shoot will spring forth from the stump of Jesse, and a branch out of his roots will bear fruit.” Jesse was the father of David, the famous giant-slayer-turned-king. From that lineage, Christ the King was born. Many of the traditions stem from Catholic roots, but many Protestant families now incorporate it as part of their Advent traditions. One of the oldest versions of the Jesse Tree can be seen in Chartres Cathedral, in a stained glass window dating back to 1150 A.D. 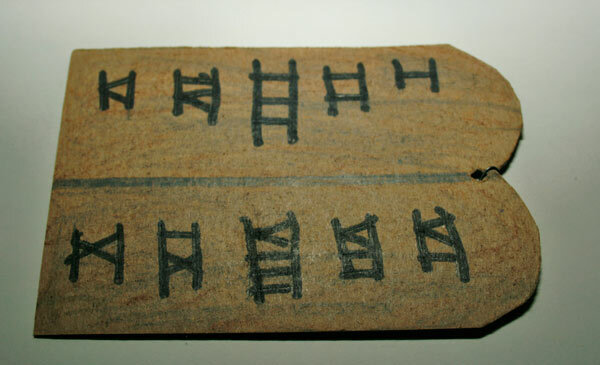 Traditionally, the Jesse Tree represents the genealogy of Christ, though modern versions more commonly represents Bible history, anticipating the coming of Christ. The last week’s celebration of the Jesse Tree is known as “O” Antiphons, or the Golden Nights. This focuses not on Bible history, but promises and prophecy. 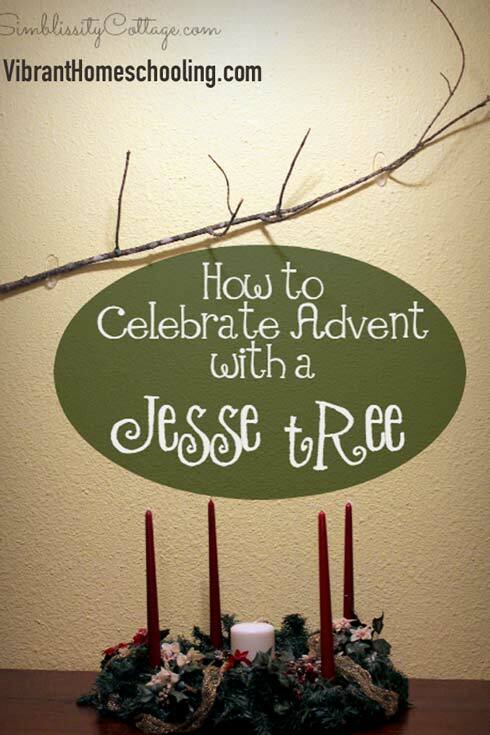 The most common way to celebrate with a Jesse Tree is to read a verse each day, summarizing a Bible story chronologically from Creation to Christ. An ornament representing that verse is hung on the Jesse Tree. The verses vary from family to family and resource to resource, but the general idea is that they begin with the creation story, the fall of man, the flood, and so forth until the birth of Christ. There are Jesse Tree devotion books that you might find in your library or Amazon like this one and there are many websites that share verses and devotional readings, such as Southwest Lutheran Church, Reformed Church in America, Life in Skunk Hollow, and Advent Idea Box. I like to use verses that are short and sweet, and easy to remember. We try to study our new verse each day, and to recite the previous days’ verses. Memorizing a verse a day is a bit challenging, but I’m amazed at how many we are able to remember as the years go by. 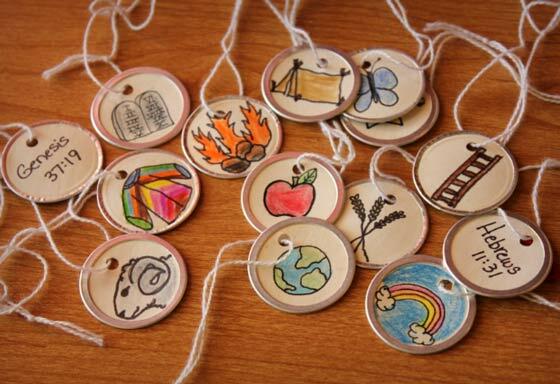 Often, the ornaments we use to represent the verses help prompt the memory a bit. Anything representing a tree is fine. You could place a branch in a vase or coffee can, use felt cut into the shape of a tree and hang it on the back of a door, or even use just a miniature Christmas tree. My family prefers a branch displayed horizontally on the wall, using removable 3M or Scotch hooks at each end to support it. These allow for the curved shape of the branch and they don’t leave residue on the wall when we’re finished. My kids love hunting for the perfect branch to hold our ornaments each year. We like to find one that has plenty of little twigs and knobs on which to hang the ornaments. The ornaments can be as unique as your family. 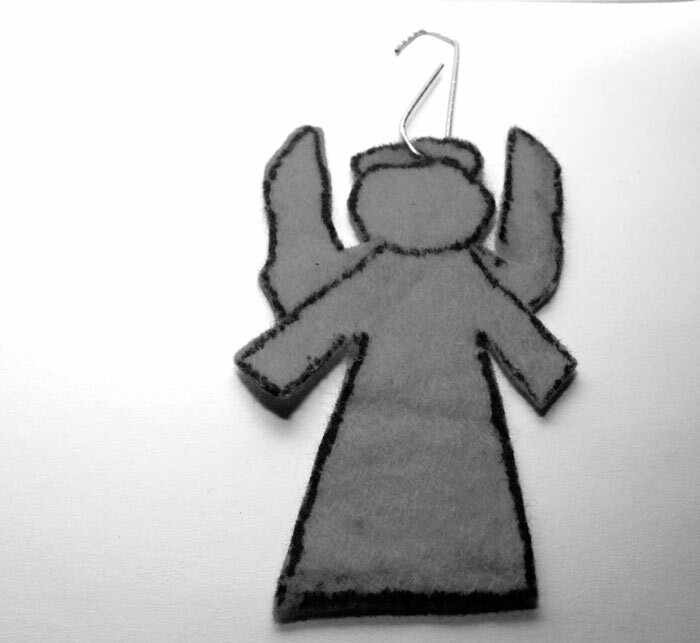 I prefer paper ornaments that we can draw or print, with the verse references written on the back. 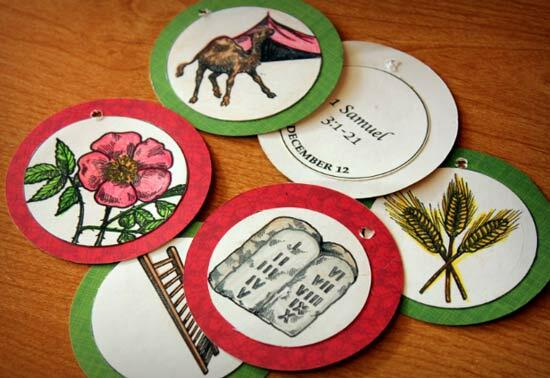 My favorite paper ornaments come from Homeschool in the Woods’ study: History of Holidays which are just beautiful. These can be printed out and decorated with scrapbooking paper, placing the image on one side and the matching Bible reading reference on the back. However, my kids prefer the dinky little ornaments that we drew and colored in many years ago. I used Metal Rim Key tags to draw simple pictures in pencil. I traced my drawings with an extra-fine point Sharpie marker and then let the kids take turns coloring each day’s ornament with colored pencils. Some families make their own ornaments with various toys and craft supplies to represent each verse. For example, the fall of man can be represented with an apple or a snake (which aren’t necessarily accurate, but they get the point across.) You could draw or print an apple or snake on a paper ornament, or you could tack string to a plastic apple or even hang a fake snake straight on the tree. The Mac & Cheese Chronicles shares some incredibly creative ideas for making your own 3-dimensional ornaments. I’ve also seen ornaments stitched in cross-stitch and sewn or glued in felt. While the Jesse Tree is a staple of our Christmas celebrations each year, my family hardly follows the traditional method. We only add ornaments and read our verses on weekdays, as part of our morning Christmas School routine. This means we leave out several verses that other sources might share. Our sideways tree is the only one I’ve seen of its kind, but it’s pretty and we like it. We only hit a few of the “O” Antiphons because we’re limited on time. Some days, we go over many verses all on the same day if our schedule gets too hectic to pace them out. Perhaps your family would even like to only do the Jesse Tree verses on Sundays, coloring all of that week’s verses during an afternoon devotion reading. Most of all, don’t feel pressure to recreate anyone else’s traditions! Enjoy personalizing this precious Jesse Tree tradition with your family. If it directs hearts to Christ the King, you’re doing it right.